The Foodie Teacher Self-confessed gastronome, broke school teacher, wannabe healthy chef, and unapologetic glutton. Recipes, reviews, and food related events. My spring break is over and school (well, work for me) started up again yesterday. I’m think I’m okay with that because that just means that we are getting closer to summer vacation and let’s not kid ourselves here–that’s the main perk of being a teacher! I’m back to going to sleep early, getting into a routine, and longing for the weekends. It’s okay though because I also have some lovely recipes to get me through the week as well! And now so will you! You have to love asparagus for this one. For the most part, this recipe is relatively low-fat, I used a very small amount of cream. Actually after I pureed it there really was no need for the cream, but, eh, why not?? Also, I think that if you don’t use a bit of cream it will dry up when you bake it. But if you’re a vegan or are trying to keep this extremely low-fat then just skip it. If you’re short on time, then skip the baking part. I was so hungry that I contemplated doing this, but I stayed the course and the reward was worth it–a crispy and chewy browned parmesan layer on the top with a warm, creamy asparagus sauce underneath. Perfection. Cook your pasta in salted water until al dente. While you’re waiting for the water to boil for your pasta, boil your asparagus stalks, not the tips. Cook for about 5 minutes. Don’t toss the water when they’re done. Just fish them out with a slotted spoon. While that’s going, in a medium sauce pan saute your onions in a bit of evoo. After a few minutes, add the garlic. Then add your chicken broth and the asparagus stalks that you just boiled. Season with salt and pepper. Cook down the broth a bit and make sure the asparagus are tender. In the small pot, toss in the asparagus tips and cook for a few minutes. Don’t over cook them! When they are finished, drain, and set aside. 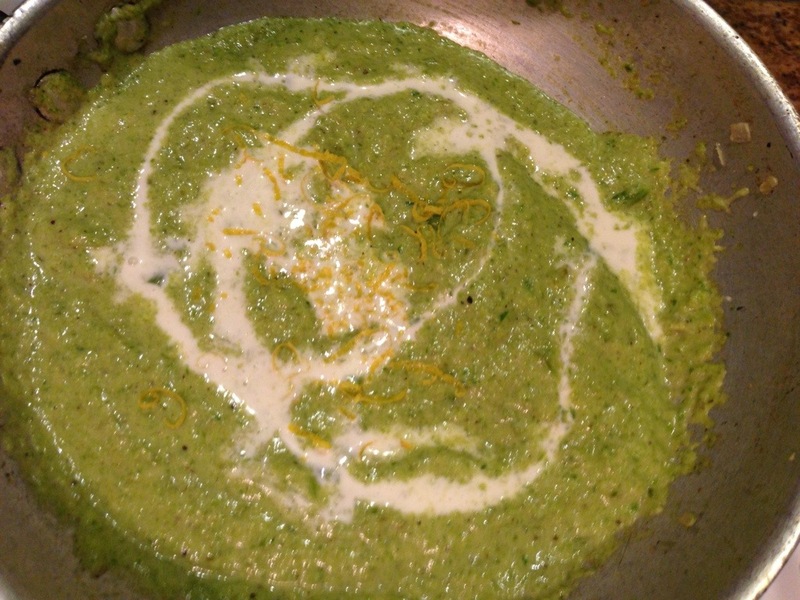 Transfer your broth/asparagus stalk mixture into a container and use an immersion blender to puree. You can also do this in a blender if you don’t have one. Return the puree back to the pan, add a bit of cream and lemon zest, and mix together. Toss in the asparagus tips and nutmeg (if you’re using it). Now you’re ready to mix your sauce and pasta. Combine in the pot. Add salt/pepper if necessary. Then transfer to a baking dish, top with grated parmesan cheese, and bake for about 15 minutes. Finish in the broiler for a crispy, browned top! ← A Valentine’s Day Picture Recap…. Mmmm buona! I love asparagus! 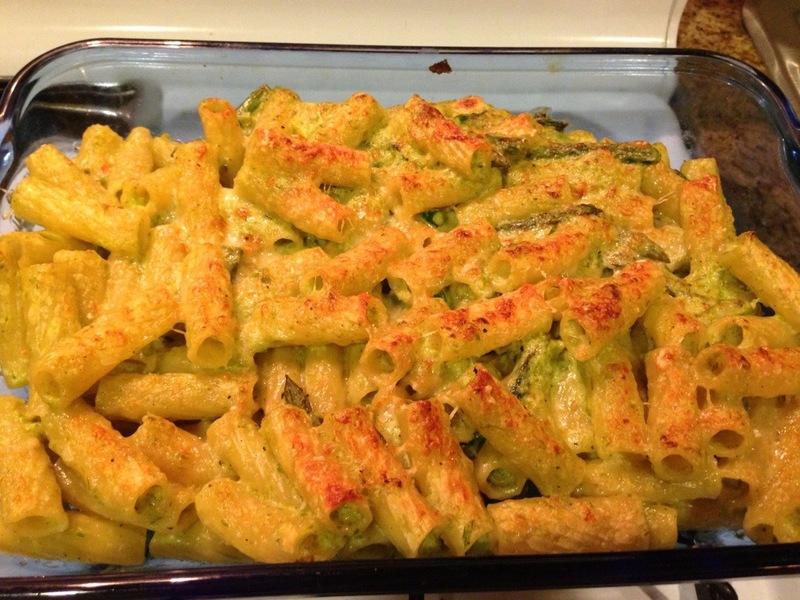 I was thinking a baked macaroni with green for tonight and this popped up. Perfect! 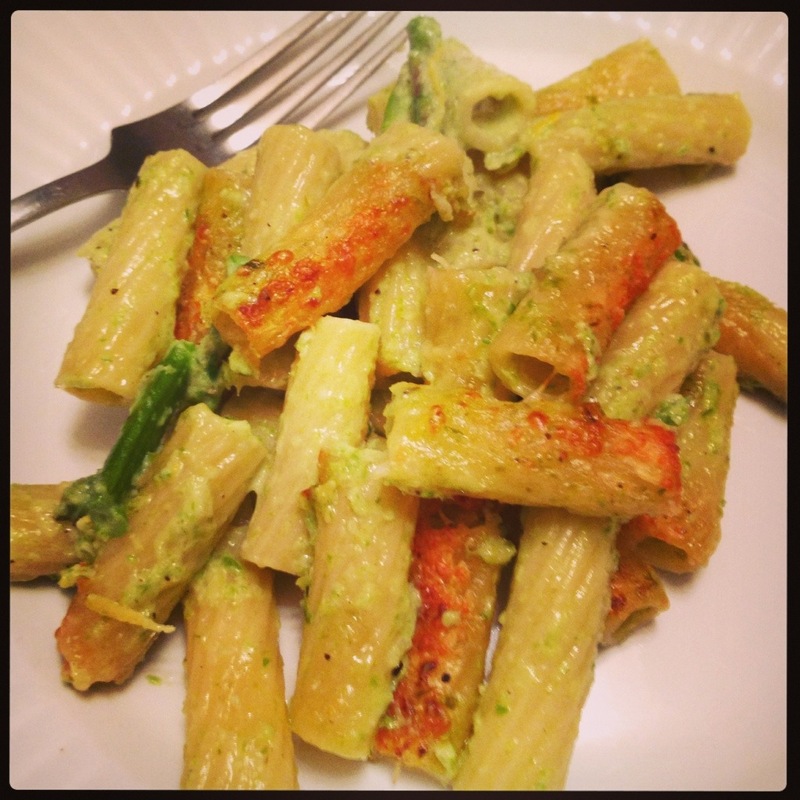 I’m making it tonight with fresh rigatoni! Thanks! Perfect, happy to hear that!! Enjoy! Let me know how it turns out! Like The Foodie Teacher on Facebook! Quintessential summer staple! Spaghetti allo scoglio—Spaghetti with Mediterranean fish, mussels, clams, shrimp, and baby squid in a light tomato sauce.